We’d love your help. 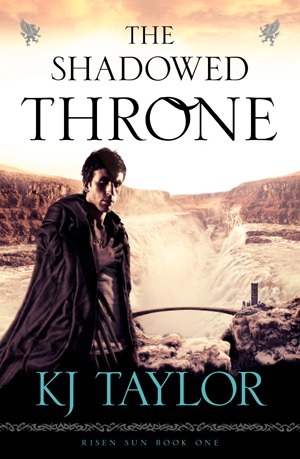 Let us know what’s wrong with this preview of The Shadowed Throne by K.J. Taylor. To ask other readers questions about The Shadowed Throne, please sign up. Certainly my favourite of the series so far, I feel like the author is finally getting a better grasp on her characters and focusing the plot. Most of this good work came in the form of Kullervo, who was involved in most of the best moments. I worry the third book in the series could fall back into recycled plotlines from the first series, but hopefully this will not be the case. Taylor's gorgeous writing hooks me again! The Shadowed Throne is impeccably plotted and wonderfully told, figuratively carrying me away into another land. I'm not sure I'll survive the wait until the concluding volume of the series. Since the groundwork was beautifully laid out in the previous title, The Shadow's Heir, is great to see that Taylor jumps right into the action and doesn't waste time specifically re-orienting readers into the world. Which isn't to say that I was confused at any point Taylor's gorgeous writing hooks me again! The Shadowed Throne is impeccably plotted and wonderfully told, figuratively carrying me away into another land. I'm not sure I'll survive the wait until the concluding volume of the series. Since the groundwork was beautifully laid out in the previous title, The Shadow's Heir, is great to see that Taylor jumps right into the action and doesn't waste time specifically re-orienting readers into the world. Which isn't to say that I was confused at any point - even a year after reading The Shadow's Heir, I found that Taylor made it very easy to slip back into the story, its characters and places. This cunningly created world is enhanced by the sequences (and there are quite a few!) told from the eyes of griffins. These are my favourite, because of the vastly different way that griffins see the world and order their priorities, although it's always somewhat of a shock to me reminded how not-human they are. Laela's story continues to captivate me - she found her way to her people, saved them, and is now ruling them as Queen. Her struggles to balance her beliefs and dreams with her need to carry on Arenadd's complicate her journey, as does the inevitable opposition from Arenadd's cousin Saeddryn. But I actually wanted a little more growth from Laela, and expected the story to focus a little more on her. The Shadowed Throne aims to tell Laela's story, but achieves this through exploring the lives and motivations of those around her - from her griffin Oeka, to the strange new-comer Kullervo. Which is rather a new way for me to read a story, but I ended up being really invested in all the peripheral characters and enjoyed how their stories wove in with that of the young Queen. One of the things I've always admired about Taylor is the way she probes cultural and social mindsets, and in particular, how she's handled the attitude of the Northerners. After their lengthy oppression and slavery at the hands of the Southerners, and only two decades after being set free by Arenadd, the Northerners are just as obsessed with the purity of blood and supremacy as their enemy. I wasn't exactly surprised by how vehement some of them are in their pursuit of revenge, but I'm still waiting for good sense to kick in and for them to realise that maybe they're better off just trying to live nice and peacefully ... I'm not too hopeful though. In previous books I've despaired at how the Gods in the story-world treat their followers - and how it's usually the most loyal who are mistreated the most. It almost physically pains me to see how the Night God treats Arenadd, but I sort of understand it. However, Saeddryn is absolutely loyal and pious in her faith, and I almost, almost, feel sorry for her! But since she's definitely my least favourite character (it's a close call between her and Oeka though), I'm not ready to feel bad for her yet! My only teeny-weeny negative about this book: it ends on a slight cliff-hanger and the story's gotten to interesting that I am desperate for the next one! I really need to know what happens. Taylor's a masterful storyteller, and I'm glad I could experience this again with The Shadowed Throne. Readers already familiar with her work will love her latest offering, and I'd suggest to fans of Fantasy looking to dip into her work to begin with the prequel trilogy, The Fallen Moon, which deals with Arenadd's amazing journey, but they could equally go straight to the first novel of this series, The Shadow's Heir. I love this series so far and I love how different it is from most fantasy these days. I felt myself trying to figure out who's side I was on a lot while reading this. Like I hate Saeddryn a lot but like the character Laela was becoming made me wonder who I would side with. In the end I would side Laela mainly because everyone she trusted is just leaving her. She wasn't prepared to be a Queen overnight people! ugh this series stresses me out because I hate seeing a character get I love this series so far and I love how different it is from most fantasy these days. I felt myself trying to figure out who's side I was on a lot while reading this. Like I hate Saeddryn a lot but like the character Laela was becoming made me wonder who I would side with. In the end I would side Laela mainly because everyone she trusted is just leaving her. She wasn't prepared to be a Queen overnight people! ugh this series stresses me out because I hate seeing a character getting ganged up on by people who choose not to hear the truth. To be safe, I won't be recording my review here until after the AA are over. Much slower than the first novel and less focus on our Heroine who is struggling as a young Queen surrounded by power struggles. Love how each party's perspective is explained and underlies the truth that we all see what we want to see. I hope there is another episode coming soon. Well-written. The reason I give this 4 stars is because the author often has characters explaining their actions and it detracted from the plot. Everything else from the twists to the character development is great, if odd. Loved it and can't wait for the next book!! This review has been hidden because it contains spoilers. To view it, click here. Didn't enjoy this as much as the first book in the risen sun series. Enjoyed the fact that now Laela has a brother but didn't find as much action and intrigue as the first book. I thought it was really good. Definitely worth reading if you've kept up with the series. Rollicking good yarn. Ends a bit abruptly...a cliff hanger...and now I have to wait for the release of the next book. She published her first work, The Land of Bad Fantasy through Scholastic when she was just 18, and went on to publish The D K.J.Taylor was born in Australia in 1986 and plans to stay alive for as long as possible. She went to Radford College and achieved a Bachelor’s Degree in Communications at the University of Canberra, where she is currently studying for a Master’s Degree in Information Studies.